A detective no one believes in. A killer with nothing to lose… A gripping standalone thriller from the Sunday Times No.1 bestselling author of the Logan McRae series. Beware of the dark… Welcome to the Misfit Mob – where Police Scotland dumps the officers it can’t get rid of, but wants to. Officers like DC Callum MacGregor, lumbered with all the boring go-nowhere cases. So when an ancient mummy is found at the Oldcastle tip, it’s his job to track down its owner. But then Callum uncovers links between his mummified corpse and three missing young men, and life starts to get a lot more interesting. No one expects the Misfit Mob to solve anything, but right now they’re all that stands between a killer’s victims and a slow lingering death. Can they prove everyone wrong before someone else dies? I shamelessly admit this man can do no wrong as an author. A convoluted book with a varied array of characters and a wealth of detail going down blind alleys and round in circles all combining to provide a surprising and satisfactory ending. The story includes one of the best chase sequences I have resd - all characters on foot - and better than anything in films or TV. Can't wait for his next work. Loved this book. Very funny and very exciting. Great characters. I hope they will have more adventures in another. book. Loved this book. Best read I've had in years. Didn't want it to end. Please Sir, can I have more? 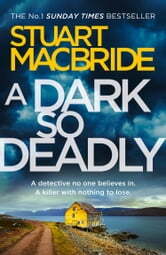 “A Dark so Deadly” is a standalone thriller written by Stuart MacBride. The first thing I come to think of after reading the book is, that it would make a great movie. The characters not all likable, mummies and a lot of police investigation make this book a really good crime thriller. If you’re not shying away from the 600+ pages this story will make for some good hours of reading. Highly recommended! I chose to read this book and all opinions in this review are my own and completely unbiased. Thanks to NetGalley and HarperCollins UK! A bit gory at times, typical of MacBride, but plenty of interest/tension points and main characters who are likeable.